Ever since Fat Lulu’s opened up in Delhi and Gurgaon, it has become a crowd favourite. After winning over hearts of Delhi-ites with their gourmet wood-fired oven pizzas, Fat Lulu’s is ready to take over once again with the introduction of Neapolitan style pizzas. A style of pizza that originated from Naples, Italy, Neapolitan pizza is made with the freshest ingredients available. A basic dough, raw tomatoes, fresh mozzarella and olive oil with no other fancy ingredients can make a scrumptious Napoli pizza. The difference lies in the abundance of sauce as compared to cheese leaving the middle of the base soggy that gives a melt in mouth feel. Fat Lulu’s has come up with a balances vegetarian – non vegetarian menu with authentic tasting Napoli pizzas. We tried the Sausage Fest pizza which was loaded with meat. Three types of sausages along with mushrooms covered the top of the pizza along with parmesan cheese as an addition to the basic tomato and mozzarella. The sauce and the dough felt so fresh that the combined taste complimented the meaty flavour of the sausages really well. 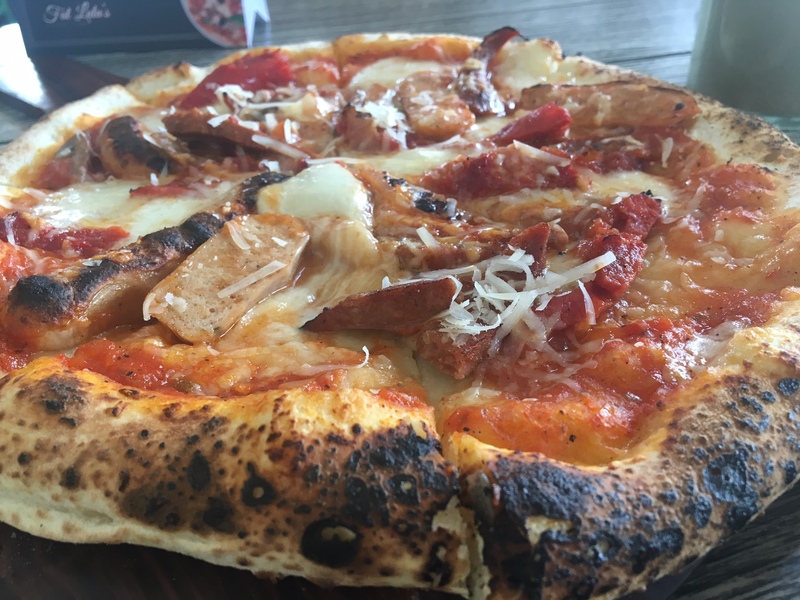 Staying true to the Neapolitan base style, the pizzas served at Fat Lulu’s also have a soggy middle which will definitely delight your taste buds. The meal was completed with some unparalleled beverages. We tried the Salted Caramel Frappe and the Caribbean Coconut, both of which were wonderfully delectable. We also got to try the light and appetising orange and fennel salad with their herb oils. The visit finished with a melt-in-mouth chocolaty nougat cake that stole the show for us. Overall, we would definitely like to recommend trying their all new Napoli Pizzas to all those pizza lovers looking for a change in the regular deep dish or thin crust pizzas. Give them a try and let us know which one is your favourite!